Impress the entire class when you know how to not only divide, but how to long divide as well. Keep sharp over the summer or during the school year with the Free Printable Division Problems Worksheet. This math worksheet for kids will ensure that you are the best divider in your class. Printable division worksheets like this one are free, which means that you can get ahead of the game at no cost. Whether you want to learn something that your class hasn't touched on yet, you need extra practice, or your a teacher looking for the perfect free worksheets for kids, this set of division problems is perfect for you. Once you get really good, see how quickly you can complete the sheet. You can even race with your parents! Teachers know that having their students learn a song will help them learn a concept more quickly and retain it, so try teaching the kids this long division song. Educational studies have shown that students are more likely to feel motivated by a task when it is turned into an activity rather than just an assignment, so make division fun rather than just homework by having them sing this catchy tune. Once they’ve learned the song, they can apply it to this printable worksheet! 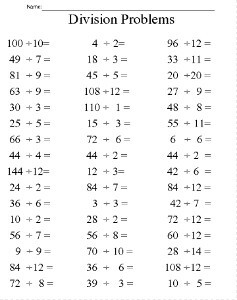 They’ll be so thankful you found this easy way to remember the process of long division. If there’s a remainder, it’s upward bound!